Driving Wyoming’s long, empty roads, rancher Shaun Andrikopoulos keeps what he calls "the ultimate in grassroots democracy" next to him in his truck. It’s a petition that a new group called the Landowners Association of Wyoming is circulating at local cafés, post offices, supermarkets and county fairs, and it holds a very big message about the power of ordinary people to change the law. "Most ranchers keep to themselves; it’s just sort of (our) nature," says Andrikopoulos, who ranches with his father in Sublette County. "So we have to step out of our comfort zone to do well carrying a petition." The group’s rallying cry centers around landowners’ rights to exert some control over energy development on "split estate" lands, where someone else — often the federal government — owns the underlying minerals, including oil, gas and coal. Forty-eight percent of Wyoming’s private land is split estate, and starting in the 1990s, the Bureau of Land Management leased the minerals under tens of thousands of acres of this private land. Once the subsurface rights are leased, surface owners have little recourse against crisscrossing roads, truck traffic, seismic exploration, wastewater pits, dust and the noise of drill rigs and generators (HCN, 9/02/02: Backlash). The oil and gas industry, meanwhile, has stamped out efforts to require drillers to negotiate with landowners over energy development plans — and the Bush administration in Washington, D.C., has helped it fend off regulations (HCN, 12/20/04: Conscientious objectors). But landowners in Wyoming refuse to give in, and other states in the West, also caught in the split-estate battle, are watching the showdown to see if a determined group of ranchers can make big energy blink. John Andrikopoulos, Shaun’s father, remembers a heated meeting between oil and gas representatives and ranchers in 2003. "An industry guy stood up and said that according to the law, ‘You have no rights.’ In Wyoming, we’re not used to people telling us we have no rights," he says. "So we decided that if it’s the law that allows industry to do this, then we’d change the law." Shortly after the meeting, the elder Andrikopoulos and about 40 others created the Landowners Association of Wyoming and attempted to convince the state Legislature to pass laws protecting surface owners. The proposed laws failed after extensive lobbying from oil and gas companies. This year, the Landowners Association resolved not to take any chances with the Legislature: The petitions the group has been circulating aim to put the split-estate issue on the state ballot in 2006, so voters can decide it. To earn a spot on the ballot, the group must gather 35,000 signatures. That’s 15 percent of the number of people who voted in the last election, and it’s a lot of signatures for a 400-member group to collect. But hundreds of volunteers, ranging from longtime ranchers to newcomers, have offered to help, according to Association President Laurie Goodman. The work seems to be paying off: Wyoming’s Legislature is considering a split-estate bill, based on the group’s initiative. Legislators are getting a lot of pressure to pass it, and not just from landowners: Many industry representatives would rather work out a bill in the Legislature, where they’ll have some say in how it reads. The current bill contains everything that the Landowners Association was hoping for, says Goodman. It obligates drillers to notify landowners 30 days before they start work, and provides for negotiation between industry and landowners about activities including road and drilling locations. If the parties don’t reach an agreement, the company can still access the land, but it must post a bond to cover future surface damages, in addition to the reclamation bond already required of all drillers. The bill also requires energy companies to compensate landowners for any losses to income, agricultural production, or land value. 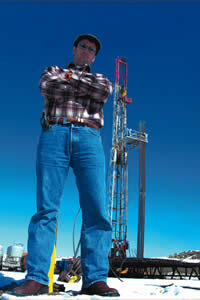 Bruce Hinchey, president of the Petroleum Association of Wyoming, isn’t fond of the bill. "We feel that we negotiate (with landowners) already, all the time," he says. "We feel that legislation isn’t really necessary." Nonetheless, supporters from both sides think the bill offers an acceptable compromise, and Gov. Dave Freudenthal, D, backs it. The power struggle between landowners and industry is raging in states throughout the West. Some states, including North Dakota, Montana, Oklahoma and Texas, require energy companies to compensate landowners for damage. But in Western states, the oil and gas industry has so far managed to shoot down bills that would obligate it to negotiate with landowners, says Kevin Williams, a Colorado field organizer for the Western Organization of Resource Councils, a community action group. The struggle in Wyoming seems to be inspiring lawmakers in other Western states, however. In Colorado, state Rep. Kathleen Curry, D, has introduced a bill that would require companies to sign a surface-use agreement with landowners before they could receive a drilling permit. If the two parties couldn’t agree, an appraiser would estimate the amount of surface damage that could be caused by energy development. If the landowner and the company still disagreed, the dispute would go to arbitration. Landowners in New Mexico and Montana are pushing similar legislation. Gwen Lachelt with the Oil and Gas Accountability Project in Durango, Colo., thinks it’s going to be tough for citizens to compete with industry lobbyists. "There are so many suits in here, and they’re all lobbying against (Rep. Curry’s) bill, telling legislators that if they support this bill, they will never get support for their campaigns," she says. "This is the largest industry in the world, and they will do all they can to keep the status quo." Ranchers in other states have considered following the Landowners Association’s example and putting an initiative on the ballot, but so far Wyoming is the only Western state to take that step. Lachelt says the industry has the power to kill ballot initiatives by pouring millions of dollars into advertising and propaganda. But Shaun Andrikopoulos points out that just the threat of a ballot initiative in Wyoming may force lawmakers to finally tackle the issue. "The political process is all about leverage," he says.